I was really into them for a long time in the 70s and it coincided with early drug influences and when I jumped from the kind of psychedelia that the Beatles put forth to kind of what was happening in our own backyard on the West Coast with the Airplane and the Dead and Quicksilver.. The Beatles stopped so I never got the chance to see them, but the Dead came around a lot and so you got to see those bands. 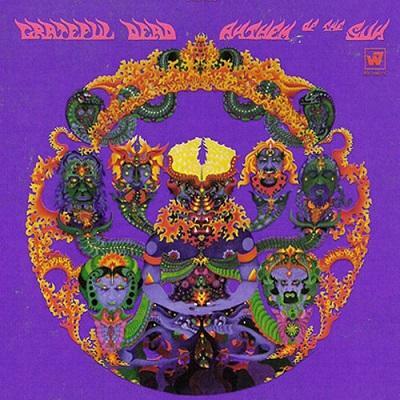 The Grateful Dead delved really deep into acoustic music, that was really important, and later their famous electric records, but Anthem of the Sun was in their early period. Anthem of the Sun was the kind of record that they were trying to construct in a studio. It’s a studio experience of a live concert experience, so they were mixing all this stuff they recorded in all the studio with all these different live takes, slowing things down and speeding things up and thinking of all these trippy aspects of the way the sound exists in stereo space. A couple of those guys, especially Phil Lesh trained alongside Steve Reich at school and studied Luciano Berio and all this 20th century modernist stuff, so he was aware of where music was going on that level and they were just at a cross roads where they weren’t sure they wanted to be a straight ahead rock band. They had moments of being a rock dance band and then they had other aspirations. I love listening to Anthem of the Sun because it may not be perfect, or achieved what they really wanted, but it’s one of those records that set its sights really high and whether or not it got all the way there it achieved something really unique. There’s not many records that sound like that, not just the fact they were splicing together live tapes from 30 different gigs, it was kind of a ridiculous stoned or drugged task from the beginning but they threw their back against the wheel, and tried to do it. If you ever listen to that record with headphones it’s so rich. I was really into them for a long time but once New York City punk and all that stuff happened I kind of dropped it like a hot potato and went onto other stuff and it was only in the last 7 or 8 years that I’ve come back to my appreciation of it through a number of different avenues. I was involved a couple of years ago with this record that this group The National put together called Day of the Dead where they covered 60 songs or something and they asked me to cover ‘Mountains of the Moon’. There were a couple of good Dead songs I was listening to at the time because they related to a song I was doing for my record with The Dust – Last Night on Earth and when I went to record with them they played me a lot of the songs they were working on and whether you like 30 minute noodling electric guitar solos or not you can put that aside and say the thing that impressed me about what they were doing was how great their song writing was. Jerry Garcia and Robert Hunter especially, wrote a lot of amazing songs together and that’s what really struck me – that’s why I liked these guys way back when because they had really great songs. Their songs are like the 60s era American songbook. And it was also in this period where I was thinking that I wanted a lyrical collaborator and so the idea of Hunter’s role with Garcia in that band especially or like when Dylan turned to either Robert Hunter or Jacques Levy for inspiration when he was working on Desire Dylan doesn’t need a lyrical collaborator - why’s he working with outside lyricists? And yet at some point he thought “I need someone else to shift the viewpoint”. So that’s what inspired me to ask Jonathan Lethem to work on Electric Trim. We’d known each other for a long time and I just felt like this was a good time to get someone else’s input, put another voice in the mix. Every single aspect of the record, words, lyrics, tunes didn’t have to spring from me. It was more like “I’ve got two chords, let’s see what we can do with them…” and over days and weeks of everyone throwing in ideas you’d shape something into a song and that’s really how we made all of our best work and it meant it was really collaborative. And on this record, I had this great collaborator with this guy Raul Fernandez and with Jonathan Lethem on the other side so it made the whole aspect of the record collaborative once again and I think that’s what I want going forward with the music.